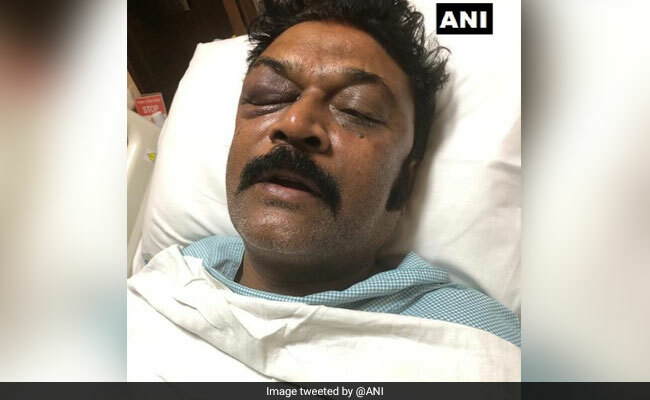 Police are on the lookout for missing Congress lawmaker JN Ganesh, who is facing a case of attempt to murder for allegedly assaulting his lawmaker colleague Anand Singh during a brawl at private resort on Saturday night, Home Minister M B Patil said Wednesday. He said Mr Ganesh, who has been suspended from the Congress, would “not be spared” and would be arrested at the earliest. “No one is above the law. Already an FIR has been lodged. The party (Congress) also has taken disciplinary action by suspending him.Police and our department are doing their duty…we are looking out,” Mr Patil told reporters here. Chief Minister HD Kumaraswamy said he has issued instructions to take action in accordance with law and no one will be protected by misusing power. “I have got information about the incident. I have not suppressed anything misusing government machinery, till now,”he told reporters. Noting that when Congress MLAs were together a “small mistake has happened,” he said it should not have occurred. Deputy Chief Minister G Parameshwara said in his 30-year-long political carrier he had not seen such “low level politics”, and it should not have happened. The Congress’s stand was that action has to be taken in accordance with law, Mr Parameshwara said. “Complaint has been given, FIR has been registered by the police (against Ganesh). Police has to arrest him and take action in accordance with law,” he said. “Our department is taking necessary steps. We will not spare him, we will arrest him (Ganesh) at the earliest,” he added. Ganesh and Anand Singh allegedly entered into a brawl at Eagleton Resorts on the city outskirts where the Congress MLAs were herded together to prevent them from BJP’s alleged poaching bid to topple the Congress-JDS government. “Nothing of that sort has happened,” he added. Besides attempt to murder, Ganesh, who was one of the MLAs reportedly under the BJP lens for desertion, has been charged with causing grievous injuries and threatening Singh. Singh’s son Siddharth Singh told reporters at the hospital that his father has fractured two ribs and a bone below the right eye. “There is a fracture below the right eye.Also, two ribs below the chest have also fractured. Doctors have decided to take a call after the swelling in the right eye reduces. Doctors have instructed that he has to undergo treatment for the next four-five days. We are praying for his speedy recovery,” he said. Meanwhile, mining baron G Janardhana Reddy who met Singh at the hospital alleged that the brawl was because of internal rift between Congress leaders, leading to factions in Ballari. “For power there was split between state leaders, at Ballari also there is split between MLAs,” he said, adding that when he was politically active in Ballari there was peace and unity among MLAs, but unfortunately they all went to the Congress.